Divorce court is one of the places that almost no one wants to be. Some couples decide to avoid it entirely (or almost entirely) by resorting to alternative dispute resolution. Mediation is the most common type, and it can be extremely useful to many divorcing couples. Florida’s courts have been using alternative dispute resolution for many years – the state’s Dispute Resolution Center came into being in the mid-1980s, meaning that ADR has been in use in Florida for over 30 years. Mediation can be ordered by a judge, though in family court most couples choose their own mediators so as to ensure compatibility and the ability to work together. All mediators must qualify under state rules every two years, and numerous committees have been established to ensure performance standards are met. 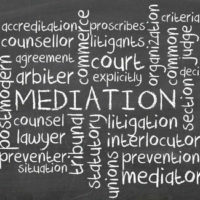 Generally, mediation is far less expensive than courtroom divorces, which is among the most important issues for many. This is mostly due to both a more informal setting than a court (so the parties can often simply sit down and discuss issues, rather than observing etiquette rituals), and also to the fact that many mediators attempt to clarify roughly how long a proceeding will take based on their own experience – an estimate of hours can sometimes help couples stay on task. Mediation is also much more private – the contents are confidential in all but the rarest circumstances. It is important to remember that a divorce mediator is by definition neutral. They may not, by definition, offer any kind of specialized legal advice,. This is one of the reasons why it is considered a good idea for each party to bring or at least consult independent legal counsel before going to mediation – that way, each party has a clear idea of what they want, what is possible, and what may not be tenable to look for in a mediation proceeding. Going through a divorce is never an optimal situation, even when the divorce itself is the best option for you and your soon-to-be former spouse. Exploring mediation as a possible alternative to divorce court may save you considerable time and trouble, but doing so with a knowledgeable divorce mediation attorney is an even better idea. At WiseLieberman, PLLC, we have experienced Boca Raton divorce lawyers well versed in alternative dispute resolution, who can help you through what can be a complex process. Contact our office today at 561-488-7788 to schedule an appointment.